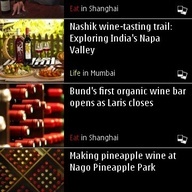 Introducing your ultimate travel companion – CNNGo’s official mobile app for Nokia. Get the latest travel and lifestyle news and views from across Asia. Discover more about your city with the best in local coverage and perspectives. Find out where to shop, play, drink, eat and escape.